Pond liners are a crucial element in any water feature and a key part of The Ecosystem Pond. It is important to use only high quality, durable pond liner that is properly installed to prevent leaks and conserve our most precious resource – water! EPDM pond liners (45 mil) are the preferred choice of both contractors and homeowners. These pond liners are very durable, yet flexible enough to conform to almost any curve or corner. Pre-formed plastic ponds restrict you to only a few available sizes while EPDM pond liner allows you to configure your pond to any shape you can imagine! Recommended liner installation includes first installing a layer of geo-textile underlayment to protect the liner. The EPDM pond liner is then installed and covered with rocks and gravel to naturalize the pond and also to protect the liner from UV rays. 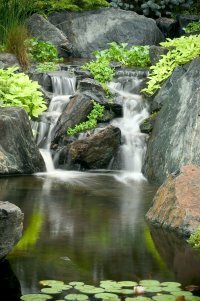 The most common practice is to use one liner for the pond and a separate liner for the stream and waterfalls. The stream liner does not need to be seamed but just overlap the pond liner. Proper liner sizing is very important since seaming liner is possible but not recommended under normal conditions. 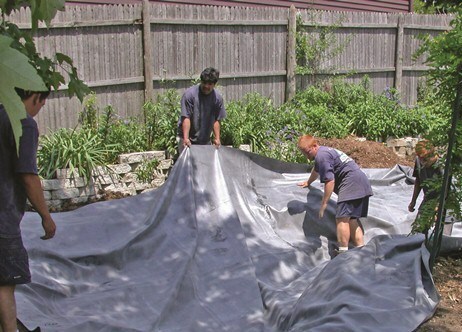 Pond liner width = Maximum Pond Width + Maximum Depth x 2 + 2 ft. Safety Factor. 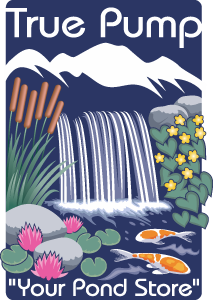 Pond liner length = Maximum Pond Length + Maximum Depth x 2 + 2 ft. Safety Factor. Stream liner width = Maximum Stream Width x 2 + 2 ft. Safety Factor. Stream liner length = Maximum Stream Length + 2 ft. Pond Liner Overlap + 2 ft. Safety Factor. True Pump carries only the best pond liner on the market – fish safe, 45 mil EPDM in sizes ranging from 5 ft. x 10 ft up to 50 ft. x 100 ft.!